Cuticle is the protective shield of Arthropods. Its basic constituents are chitin (the polymer of N-acetylglucosamine) and proteins. These two macromolecules are combined to build a complex structure, not only strong, but flexible as well. The architecture of cuticle is helicoidal and most probably this building plan is responsible for its extraordinary mechanical, thermal and physiological properties. In this helicoidal structure, chitin is in the form of crystalline filaments and proteins play the role of the matrix. Although chitin is a simple polysaccharide, the second constituent of cuticle, proteins, present a great variety. Dozens of different proteins may appear in the cuticle of a single organism on a single moment. These proteins may differ between developmental stages or, most commonly, their quantitative distribution may change. It seems that the combination of specific proteins at specific quantities is unique for each region of cuticle, for each developmental stage and for each species. However, in this variety some common features can be found. All structural cuticular proteins are small (with an average length of 100-200 aminoacid residues), they lack cysteine and share several characteristic motifs. These motifs may be small (e.g 3 residues) and repetitive or large (68 residues) occurring only once (3,4). The most well known motif was recognized by Rebers and Riddiford in 7 cuticular proteins and was called “R&R motif” (1). As more sequences became available, this motif was widely recognized (2). The initial consensus was 35 amino acids long, but now encompasses 68 residues as sequence similarity was recognized at its amino-terminus and the carboxy-teminus was shortened (3,4). This 68 amino acid region, named the "extended R&R consensus" is what is recognized by PF00379, the Pfam motif for chitin binding of Arthropod cuticle (3, 4, 5). This "extended R&R consensus" is most probably dominated by b-sheet structure (6,7). Three types of the "extended R&R consensus" have been found: RR1, RR2 and RR3 (8, 9). The two main types are RR1 and RR2, which presumably appear in proteins from soft and hard cuticles, respectively (8). Very few cuticular protein sequences show the existence of RR3 (9). Actually, the secondary structure predicted for these two types RR1 and RR2, verifies the fact that they appear in regions of cuticle with different properties (7). 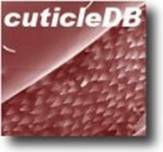 cuticleDB is the first database of Arthropod cuticular proteins. The goal of its constructors was the collection of all cuticular protein sequences that have appeared to date and their detailed and correct annotation. The better the organisation of the data, the easier the work will be for researchers dealing with cuticle and structural proteins in general. It is hoped that, this database will be of help to genome annotators in the near future when more arthropod genomes will become available. Furthermore, it is hoped that, detection of common properties of these proteins, as well as recognition of important differences that are responsible for cuticle’s complexity and important functions will be facilitated by its existence. The database will be updated at regular intervals. By 'Searching in fields' the user can search for any text in the fields of his/her preference. The user can enter any word/expression in one or more of the available boxes under the name: 'Name', 'Taxonomy', 'Pattern' and 'References'. iii) Operator '&' for AND, which combines two (or more) sub-expressions in a single field and gives the user the opportunity to search for entries that satisfy all sub-expressions. iv) Operator '|' for OR, which combines two (or more) sub-expressions in a single field and gives to the user the opportunity to search for entries that satisfy at least one of the sub-expressions. v) Operator '!' for NOT, which can only be used at the beginning of an expression and does not connect two sub-expressions. It provides to the user the opportunity to search for entries that necessarily do not satisfy the expression after the '!'. vi) Operator '&!' for AND NOT, which combines two (or more) sub-expressions in a single search field and gives to the user the opportunity to search for entries that satisfy only the sub-expression in the left of the operator. 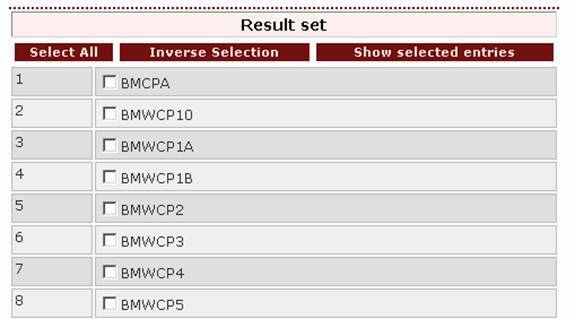 Expressions in separate search fields are combined with the AND operator, so every entry of the result set will satisfy the expressions of all the search fields the user has chosen. The four available search fields are shown as four boxes named: 'Name', 'Taxonomy', 'Pattern' and 'References'. 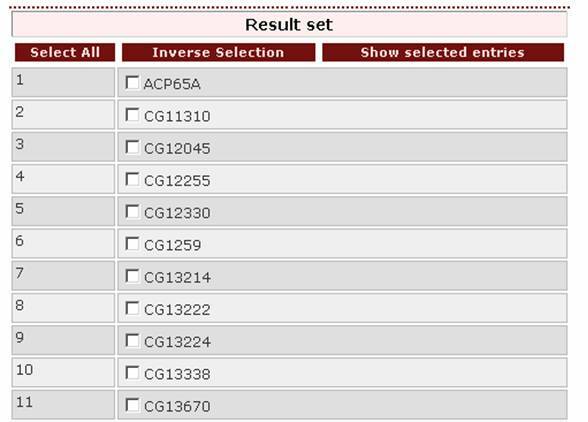 Each box (apart from the 'Pattern' box) corresponds to a certain field of the database entries. - 'Name' corresponds to the field 'Protein name' of an entry. The text written by the user (query) is searched against the information included in all cuticleDB entries under this field. It is not necessary to have an exact match between the query and the complete name of a protein. The only condition for a positive result is that the query is part of the protein name of at least one entry. Moreover, the search is not case sensitive, so the user does not have to worry about uppercase and lowercase letters. 1. 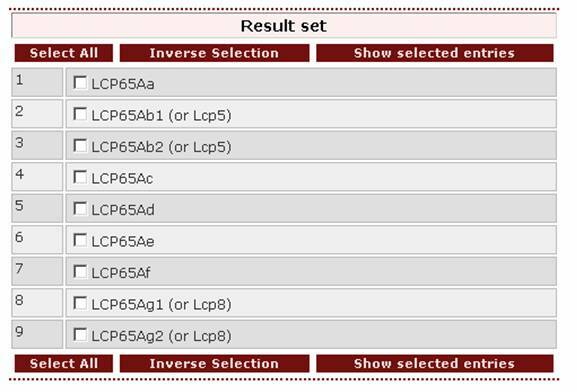 If the user wants to retrieve a protein that he/she has found in the literature under the name LCP65Aa, the query should be this name exactly. As a general advice for someone who wants to retrieve the entry of one specific protein, he/she should set as a first query the protein name found in the literature. In case the search is negative, the user should try to shorten the query. 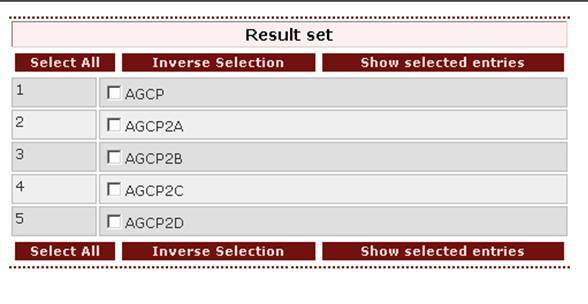 For example, searching for the Manduca sexta protein with the query ‘MsCP27’ or ‘mscp27’ (as the search engine is case insensitive) does not give a result. 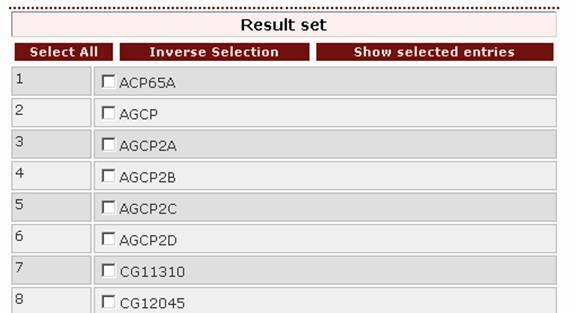 However, searching with the query ‘cp27’ it produces a positive result. 2. 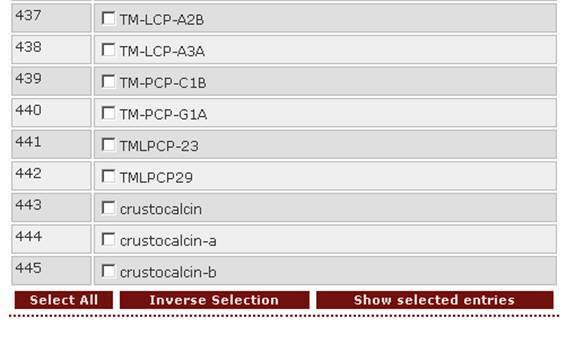 If the user wants to retrieve one or more proteins that are expressed in the larval cuticle, a proper query would be ‘LCP’. - 'Taxonomy' corresponds to the field Taxonomy of an entry. The query may include the name of any taxon from the rank of superkingdom to genus; but, be careful!, not species. The query should match with at least part of the taxonomy field in one or more entries. 1. If the user wants to retrieve all cuticular proteins from the genus Drosophila, he/she should use this name as a query in the Taxonomy box. Setting half of the genus’ name as a query: ‘dros’ will also work. 2. If the user wants to retrieve all protein entries assigned to Anopheles and Drosophila, the proper query is ‘Anopheles | Drosophila’. 3. If the user wants to retrieve all proteins from the order Lepidoptera apart from those of the genus Hyalophora, then an appropriate query is ‘Lepidoptera &! Hyalophora’. 4. 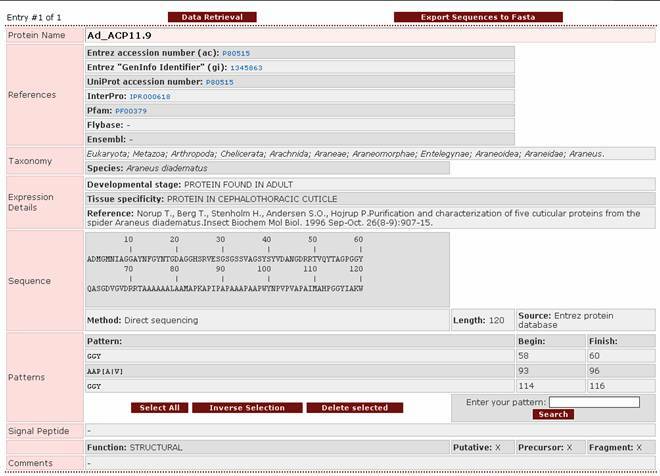 If the user wants to retrieve all protein entries of cuticleDB, an easy way is to set as query the word ‘Arthropoda’ in the Taxonomy search field. The character '|' in order to separate these choices. If the user wants to search all cuticleDB proteins for the pentapeptide ala ala ? phe his, the right query-pattern would be ‘AAXFH’. Of course, ‘aaxfh’ would also be valid. If the user wants to search for the pattern tyr val (phe / tyr), the right query-pattern would be ‘yv[f|y]’. Note: The query ‘yv(f|y)’ is not valid. If the user wants to search for the pattern tyr val (phe/tyr/trp), the appropriate query-pattern is ‘yv[f|y|w]’. - 'References' corresponds to the entry field References. The query may be one of these codes: 'Entrez accession number', 'Entrez gi', 'Uniprot AC', 'FlyBase ID', 'Ensembl ID' or 'Pfam'. (InterPro codes in the near future). The query is searched against the various database codes included in the field References of all entries. If the user wants to retrieve the entry of a protein coded P81581 by Uniprot, the proper query is this exact code in the References search field. If the user wants to retrieve entries of proteins he/she has found in several other databases, for example both Uniprot and Entrez, the appropriate query would combine all the different codes e.g. 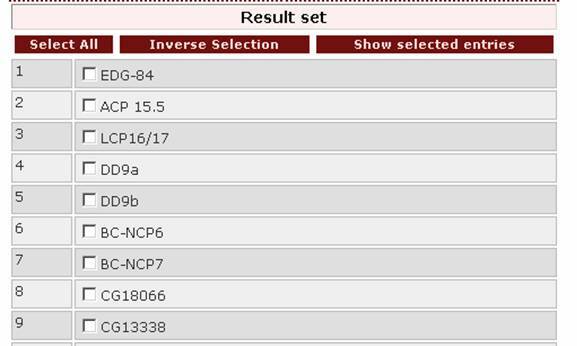 ‘P81584 | P81585 | 102879 | 113012’, where the first two are Uniprot Accession Numbers and the last two are Entrez GenInfo Identifiers. 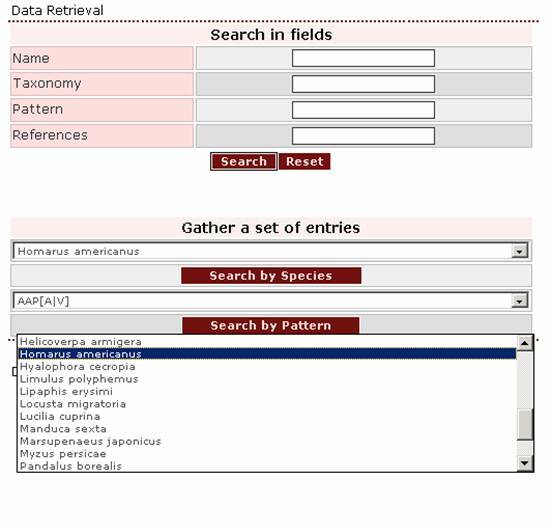 If the user wants to retrieve all Anopheles proteins that bear the motif GGLG, then ‘Anopheles’ should be written in the Taxonomy search field and ‘GGLG’ in the Pattern search field. If the user wants to retrieve all Anopheles proteins that were not taken from the Anopheles gambiae genome project, ‘! 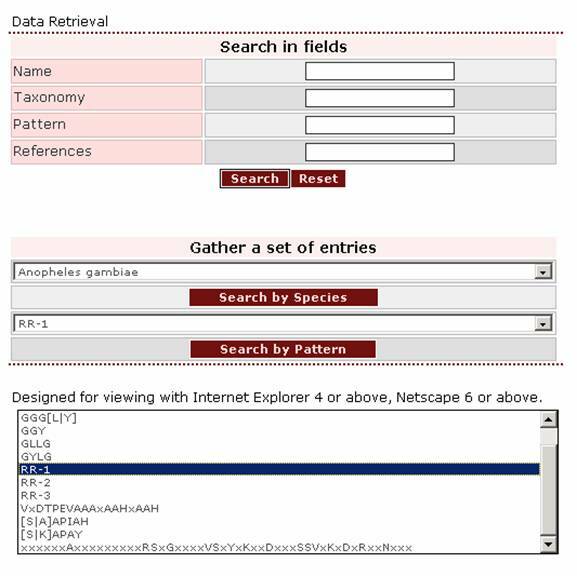 ensangp’ should be written in the Name search field and ‘Anopheles’ in the Taxonomy search field. Gathering a set of entries is another way for retrieving data. 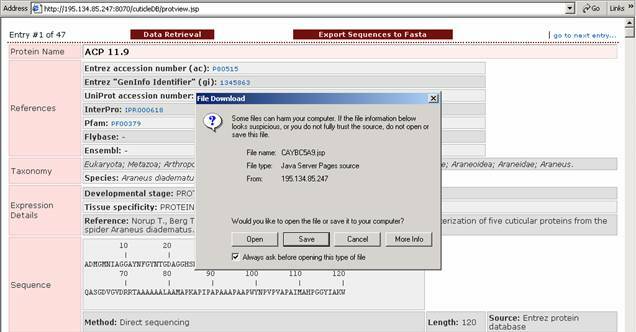 The user can retrieve all database entries referring to proteins that derive from the same species or proteins that share a common pattern in their sequence. Contrary to the patterns in the “Search in fields”, patterns in the “Gather a set of entries” are pre-determined by the creators of the database. These patterns have been reported in the field Patterns of the detailed view of an entry. 1. If the user wants to retrieve all entries describing proteins of the species Homarus americanus, this species should be selected from the pull-down list in the “Search by Species” box. 2. If the user wants to retrieve all proteins bearing the RR1 pattern, this pattern should be selected from the pull-down list in the “Search by Pattern” box. Additionally, by clicking on the button 'Select all' all the entries of the result set are selected. 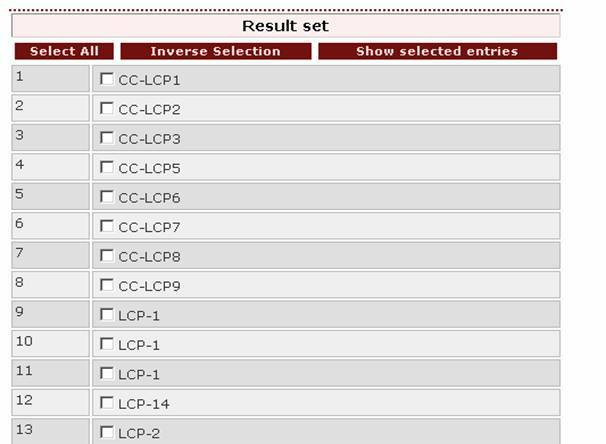 By clicking on the button 'Inverse selection' all unchecked boxes are selected. at the upper right corner of each entry. This entry belongs to protein Ad_ACP11.9, which is a cuticular protein of Araneus diadematus. Protein name: Contains the name of the protein. In the majority of the proteins, this name corresponds to the name given by the scientist who determined its sequence. This name may derive from the protein’s molecular mass or from the order in which this protein was obtained. Some names include the first letter of the genus and the first letter of the species from which the protein was extracted. The name quite often includes the first letter of the developmental stage at which the extraction took place, for example a name may include the letters ACP for Adult Cuticular Protein. However, this protein may not necessarily be stage-specific; it may just have been found at that stage (3,4). For proteins obtained from the Drosophila melanogaster or Anopheles gambiae genome project, the identifier attributed by FlyBase or Ensembl, accordingly, has been held. · EDG-91 (Ecdysone Dependant Gene and number given by the researcher). References: Contains codes of the protein in other databases. These codes act as links, as well. References are provided for the following databases: Entrez Protein database (accession number and GenInfo identifier are available), Uniprot, Interpro, Pfam, FlyBase, Ensembl. Taxonomy: Contains an hierarchical description of the organism that expresses the protein. The description includes all the taxa from superkingdom until genus. The species’ name is provided in a separate text-box. It should be mentioned that all taxonomic information has been extracted from Entrez Protein Database. Expression Details: Contains information about the time and spatial distribution of the protein or the corresponding mRNA. The subfield Tissue specificity concerns the appearance of a protein in specific areas of cuticle or the occurrence of the corresponding mRNA in specific tissues. The subfield Developmental stage concerns the appearance of a protein or the corresponding mRNA in a certain developmental stage. The subfield Reference shows the bibliographical source used for this field. 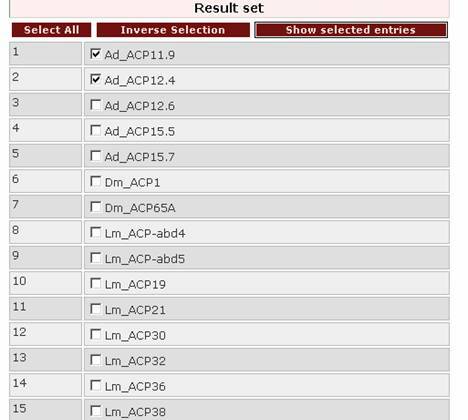 Sequence: Shows the protein sequence, which can also be shown in FASTA format. Aminoacid numbering is shown above the sequence. The subfield Method provides information about the biochemical method of sequencing. This method may be direct sequencing of the protein, conceptual translation of the protein’s mRNA or cDNA or both (for example a protein sequence may have been derived from conceptual translation of a cDNA and then checked by partial direct sequencing of the protein). The subfield Length shows the number of aminoacid residues in the protein. The subfield Source shows the protein database from which the sequence was obtained. All the above patterns, apart from RR1, RR2 and RR3, were located for each entry, utilizing a home-made tool, specifically created for seeking motifs of the Prosite type. 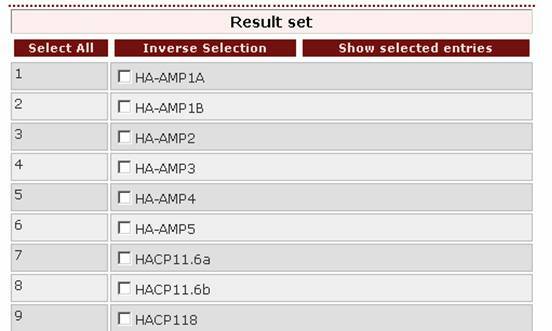 The RR1 and RR2 patterns were located, utilizing Profile Hidden Markov Models that were created specifically for this database (unpublished), using the HMMER software package (version 2.3.2) (10). All information given about the existence of the RR3 motif has been drawn from literature. Please, note that the RR1 and RR2 Prosite patterns may not be exactly the same in the protein entries that have been marked as bearing the RR1 and RR2 patterns, since the existence of the RR1 and RR2 patterns has been detected in the protein sequences of cuticleDB using profile HMMs, as explained above. Furthermore, the RR1 pattern (built utilizing profile HMMs) is actually larger than the one shown here, but given its diversity, no Prosite type pattern can be built for the entire length of RR1. Signal Peptide: Shows the start and end position of the signal peptide. The signal peptides have been detected using SignalP 2.0 (11). More specifically, the Y score of the Neural Network prediction was used as a selection criterion and the default threshold, 0.32, was used as cut-off for the prediction. The protein sequences that were derived from proteins extracted from cuticle - thus, they had already been secreted and had their signal peptide cleaved off- do not possess a signal peptide. Function: Shows the function of the protein. All proteins in the current version of cuticleDB are structural. This field will be of importance when proteins of other functions will be included as well. Putative: Proteins are classified as putative cuticular proteins unless at least one of the following criteria has been met. Criteria are: complete or partial amino acid sequence data from proteins isolated from cuticle, or an antibody raised against a specific protein reacts with cuticle or with proteins isolated from cuticle, or an antibody raised against a cuticle extract reacts with a translation product from a specific cDNA, or a specific mRNA has been detected in cuticle secreting epidermis. Preliminary: Indicates that the sequence based on genome annotation or single pass sequencing appears to be incomplete or incorrect or has been designated by the annotators as preliminary. Fragment: Gives information about whether the whole sequence or just a fragment of a certain protein is provided. Comments: This field may include information of great diversity, such as the existence of protein isoforms, polymorphic sites or the specific strains from which a certain sequence was derived. our web-server sends a text content with all the sequences of the selected set in Fasta format. Different web-browsers may manage this text differently. For example, Windows Internet Explorer asks the user how to handle it, that is, view it with an associated program or save the content in a file. The user must choose ‘Save’ and then save the file as type “All files” and with a suitable name e.g. “fasta.txt”. Then he may view the file with an appropriate text viewer. Notice that programs like Notepad are not suggested; use WordPad instead. In addition, other web-browsers like Netscape or Mozilla, display the text content directly. 1. Rebers, J.E. and Riddiford, L.M. (1988) Structure and expression of a Manduca sexta larval cuticle gene homologous to Drosophila cuticle genes. J. Mol. Biol., 203, 411-23. 2. Willis, J.H. (1999) Cuticular proteins in insects and crustaceans. Am. Zool., 39, 600-609. 3. Andersen, S.O., Hojrup, P. and Roepstorff, P. (1995) Insect cuticular proteins. Insect Biochem. Mol. Biol., 25, 153-76. Review. 5. Rebers, J.E. and Willis, J.H. (2001) A conserved domain in arthropod cuticular proteins binds chitin. Insect Biochem. Mol. Biol., 31, 1083-93. 6. Hamodrakas, S.J., Willis, J.H. and Iconomidou, V.A. (2002) A structural model of the chitin-binding domain of cuticle proteins. Insect Biochem. Mol. Biol., 32, 1577-1583. 7. Iconomidou, V.A., Willis, J.H. and Hamodrakas, S.J. (1999) Is beta-pleated sheet the molecular conformation which dictates formation of helicoidal cuticle? Insect Biochem Mol Biol., 29, 285-92. 8. Andersen, S.O. (1998) Amino acid sequence studies of endocuticular proteins from the desert locust, Schistocerca gregaria. Insect Biochem. Mol. Biol., 28, 421-434. 9. Andersen, S.O. (2000) Studies on proteins in post-ecdysial nymphal cuticle of locust, Locusta migratoria, and cockroach, Blaberus craniifer. Insect Biochem. Mol. Biol., 30, 569-577. 10. Eddy, S.R. (1998) Profile hidden markov models. Bioinformatics, 14, 755-763. 11. Nielsen, H., Engelbrecht, J., Brunak, S. and von Heijne, G. (1997) Identification of prokaryotic and eukaryotic signal peptides and prediction of their cleavage sites. Protein Engineering, 10, 1-6.